Misericordia commit pitched every inning for the PIAA semifinalist Trojanettes, striking out 171 batters with a 1.24 ERA. Also a skilled hitter, Bohn had a team-high .378 average and five home runs. En route to making the district final and state semifinals, Sobeck reached base in all six playoff games. She was either No. 1 or 2 on the team in batting (.338), doubles (eight), RBIs (17) and runs (17). Ryan Stetz stepped down Friday as Nanticoke Area’s softball coach, three days after his team’s season ended in the PIAA Class 4A state semifinals. Stetz coached Nanticoke Area for the past six seasons and had a 61-23 record in Wyoming Valley Conference regular-season games. He was an assistant for three years prior to taking over the program. “It’s really every year the job is open and I’m just choosing not to reapply,” Stetz said. “Realistically, I think I’m in a good spot personally (with my family) and professionally in my life and will always care for the program. And for the program’s stake, it’s a great opportunity for the next person to come in with a great young team and an opportunity to play on a new field (at the high school). Nanticoke Area is losing just two starters – pitcher Miranda Bohn and third baseman Megan Murphy. The Trojanettes finished second in Division 2 of the Wyoming Valley Conference and finished as District 2 Class 4A runners-up. “With the way the group of kids come through, it was in the back of my mind,” said Stetz, who teaches social studies at the high school. “When you’re around kids everyday, there are so many opportunities that realistically I wanted to leave it open to do other things professionally. Stetz’s teams twice made it to within a win of playing for a state championship. Both times the Trojanettes lost to District 11 champion Bethlehem Catholic. The other loss was in 2015 in the PIAA Class 3A state semifinals. Stetz took over the program in 2013 after long-time coach Gary Williams resigned. He coached the Trojanettes to second-place finishes in Division 1 of the Wyoming Valley Conference in 2013 and 2014, both times ending up behind Hazleton Area. 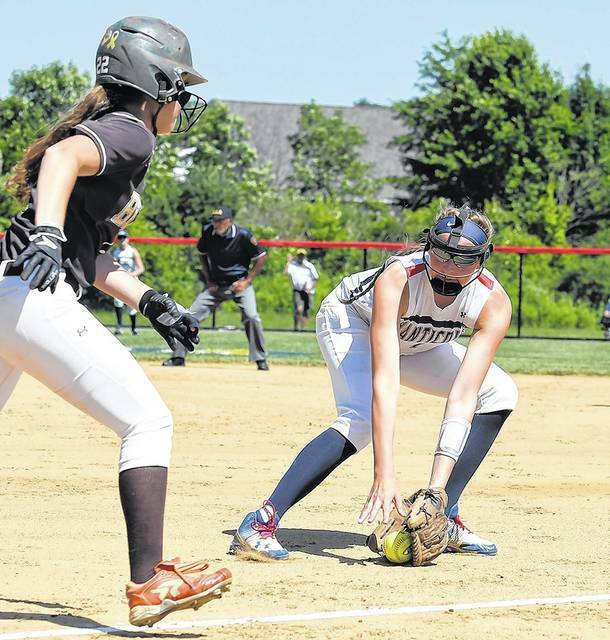 The WVC realigned softball in 2015 and Nanticoke Area finished tied for first place in Division 2 with Wyoming Area, only to lose in a special playoff game to determine the champion. The Trojanettes went on to the District 2 Class 3A championship, the ninth district title in the program’s history. In 2016, Nanticoke Area tied for the WVC Division 2 title, but once again lost in a special playoff game – this time to Tunkhannock. The Trojanettes broke through in 2017 by winning the WVC Division 2 crown. The time is right for Ryan Stetz to move on. That’s what Stetz told his players Friday, the day he announced he will not be reapplying for his job as head softball coach at Nanticoke Area. The news came three days after Nanticoke Area’s 11-0 loss against Bethlehem Catholic in the PIAA Class 4A semifinals. It was another successful season under Stetz, who was appointed head coach in 2013 and led the Trojanettes to six straight winning seasons. Stetz had been an assistant coach in Nanticoke Area’s softball, football and boys basketball programs before taking on softball full-time. Stetz was the hand-picked successor to Gary Williams, who coached the Trojanettes to PIAA titles in 2003 and 2010. Stetz — who said he doesn’t have any immediate plans to jump back into coaching — is a high school social studies teacher at Nanticoke Area, primarily focusing on seniors. He had two seniors on this year’s team — pitcher Miranda Bohn and third baseman Megan Murphy — who experienced some of the greatest seasons in program history with Stetz. The Trojanettes made the state’s Final Four in 2015 and 2018, while also going undefeated in the regular season last year and winning a district championship in 2015. Stetz thanked his players and said that, given who’s returning to the team next year, the Trojanettes have a bright future ahead. Stetz added he made his decision now because he wanted to put the program in the best position moving forward, allowing Nanticoke Area to hire someone who will lead the Trojanettes in offseason training. All the good fortune that Nanticoke Area had been riding through the state softball playoffs took a sudden turn for the worse. And that dramatic twist of fate helped rearrange the Trojanettes’ hopes of playing for a state championship during an 11-0 loss to Bethlehem Catholic. They say good teams make their own breaks. But there isn’t much you can do when the ball is breaking the other way all the time. It was enough to finally break the back of a proud and gallant Nanticoke Area team, which reached the PIAA Class 4A semifinals after an opposing runner left third base too soon in one game the Trojanettes went on to win in 14 innings and Madison Stashak came back into another state game to deliver the winning single in the ninth. They didn’t come anywhere near extra innings in the semifinals Tuesday because destiny deserted the Trojanettes right from the first inning. Brinley Sobeck, Nanticoke Area’s third hitter of the game, launched a shot long enough to clear the left-field fence. But it sailed well foul and Sobeck was eventually called out on strikes. Nanticoke Area’s Megan Murphy unloaded a similar blast down the left-field line that had the Golden Hawks holding their breath before curling foul in the sixth inning. Rather than rattle Bethlehem Catholic pitcher Tatum Kresley, those fouls allowed her to make up for some mistake pitches. And in the fifth frame of a 2-0 game, Miranda Bohn didn’t quite get enough of her attempt to tie the game with a runner on base, as her long fly to deep left field settled into the glove of the Hawks’ Jaden Spigner. On the other side, Bethlehem Catholic was doing pretty well with its own karma being kind. Addie Roche’s double fell inches inside the right field foul line and just out of reach of diving Nanticoke Area outfielder Jen Kurkoski to produce the game’s first run in the second inning. And the Hawks added a second run when Kresley sliced a double that dropped just fair down the left-field line before she came around to score in the fifth. 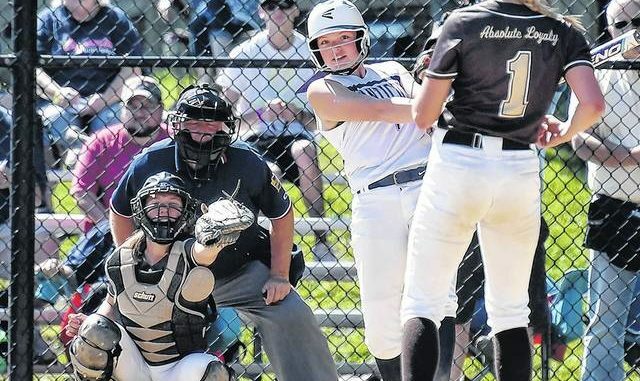 Those luckless little jabs that left the Trojanettes behind by a bit turned into a flood of big blows during Bethlehem Catholic’s nine-run seventh inning that put the game out of Nanticoke Area’s reach. Mainly because of a girl who didn’t even reach base in that inning. Or the game, for that matter. Yet, Bethlehem Catholic’s Morgan Christine helped wrap up the game when she fouled off 11 straight balls while sapping energy from Nanticoke Area pitcher Miranda Bohn before popping out back to the circle. It was already a 4-0 game by that point. But Bohn, who fanned seven batters and struck out Christine three times before that, couldn’t find anything to put another batter away. And five hits and seven runs after that, the Hawks had put the game away instead. In the late innings, working under a hot sun, even the gallant effort of a pitcher as good as Bohn wasn’t enough to stop a bad ending for the Trojanettes that was highlighted by a memorable at-bat from a hitter who wasn’t swinging so good. PINE GROVE — The final score, no doubt, looked ugly — Bethlehem Catholic 11, Nanticoke Area 0. But for six innings Tuesday, anyway, the Trojanettes were right there. 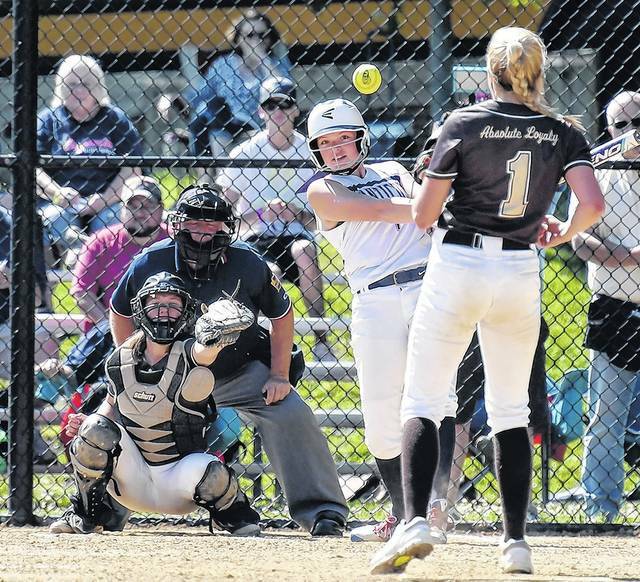 A break, a hit, a Becahi mistake away from making a close PIAA Class 4A softball semifinal game even closer. Then came the seventh, which was easily Nanticoke Area’s worst inning of the season. 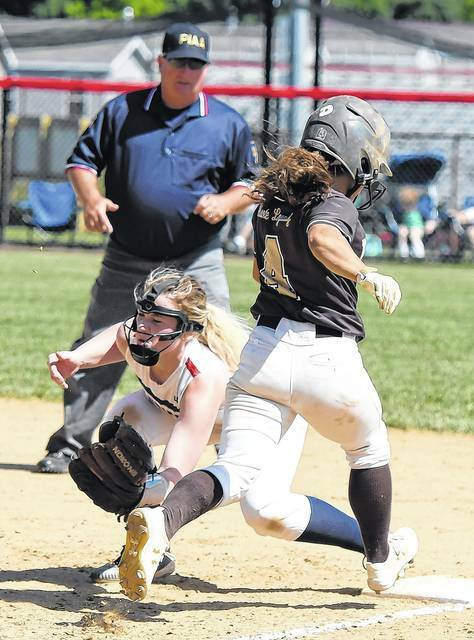 Becahi banged out nine hits and scored nine times, ending Nanticoke Area’s season for the second time in four seasons and once again in a state semifinal. The Golden Hawks defeated the Trojanettes 5-0 in the 2015 Class 3A state semifinals. District 11 champ Becahi delivered the knockout in the seventh. Four Hawks had RBI singles and Alyssa Jimenez had a two-run triple in the inning. But the biggest at-bat arguably came from the player who made the first out of the inning — Morgan Christine. Christine fouled off 11 consecutive two-strike pitches before hitting a lazy, low popout to Nanticoke Area pitcher Miranda Bohn. “I was definitely feeling tired,” said Bohn, who threw 198 pitches in a 14-inning quarterfinal victory on Thursday. “But I definitely wasn’t giving up. I was just trying to help my defense and get outs anyway I could. Until the seventh, Bohn had allowed just five hits — including a RBI double in the second and an RBI double in the fifth — and recorded seven strikeouts. Nanticoke Area had its chances a couple times before the Hawks pulled away. Bohn singled with one out in the first inning and Megan Murphy walked an out later, but both ended up stranded. Then in the fourth, Brinley Sobeck opened with a double and Murphy followed with a single. Again, nothing against Becahi pitcher Tatum Kresley, who finished with eight strikeouts. “We’ve faced some dominant pitchers and she was another one,” Stetz said. Nanticoke Area got two-out singles from Gabby Rakowski in the fifth and Jilann Baron in the sixth, but came up empty. Murphy and Bohn, who both started as freshmen against Becahi in 2015, finished up their Nanticoke Area careers. After an emotional moment with Bohn, Murphy tried to put the situation in perspective. Becahi will play District 9 champ Punxsutawney at 1:30 p.m. Friday at Penn State for the Class 4A state championship. WARREN RUDA / STAFF PHOTOGRAPHER Nanticoke Area’s Miranda Bohn delivers against Bethlehem Catholic in the PIAA softball semifinals on Tuesday. WARREN RUDA / STAFF PHOTOGRAPHER Tatum Kreslev pitched for Bethlehem Catholic. PINE GROVE — Sometimes, the final score is not indicative of what actually happened in a game. Fans and team members from both sides would agree that Tuesday’s PIAA Class 4A softball semifinal fits the bill. Left-hander Miranda Bohn pitched six strong innings for Nanticoke Area, which drubbed five hits and drew two walks against Bethlehem Catholic ace Tatum Kresley, one of the best pitchers in the state. Unfortunately for the Trojanettes, a miserable seventh inning made their season-ending defeat look worse than it was, as Becahi beat Nanticoke Area, 11-0, and advanced to the state championship game. “I know you can’t erase the runs off the board, but we went toe to toe with them for six innings,” said Nanticoke Area head coach Ryan Stetz. The runner-up in its division and district, Nanticoke Area’s season closes with a 12-7 record. District 11 champion Becahi (21-5) will play for the state title against Punxsutawney 1:30 p.m. Friday at Penn State. Having played three straight extra-inning games that amounted to 33 innings, Stetz said fatigue may have played a role in Nanticoke Area giving up nine runs in Tuesday’s seventh inning. “When you go to the well that many times, extra innings, against high-quality teams on a state level in 4A, it’s only a matter of time that it’s going to happen,” Stetz said. Nanticoke Area had its chances at the plate, stranding a pair of runners on base in both the first and fourth innings. Meanwhile, Becahi took advantage of its few opportunities. Catcher Julia Sledz started the second inning with a leadoff walk, her first of three free passes. Three batters later, No. 7-hitting third baseman Addie Roche hit a two-out double to shallow right field that scored Sledz and made it 1-0. The score remained 1-0 into the fifth, as Kresley, a sophomore who’s verbally committed to play at Rider, weaved in and out of trouble while pitching. Kresley led off the fifth inning with a double, eventually coming around to score on Alyssa Jimenez’s RBI single that made it 2-0. In the circle, Kresley pitched a seven-inning shutout with eight strikeouts. At the plate, she batted No. 9 and went 3 for 4 with two singles, a double and two runs scored. The game was not without its Nanticoke Area highlights, including singles by Bohn, Gabby Rakowski and Jilann Baron. Brinley Sobeck ripped a leadoff double to left in the fourth. Senior Megan Murphy was 1 for 2 and drew a walk. Leading 2-0 entering the seventh, Becahi batted around the order with 13 plate appearances in the final inning. The first five batters had gotten on base before first baseman Morgan Christine battled and fouled off at least a dozen straight pitches before Bohn eventually got her out with a pop up. “These four years, we’ve accomplished so much,” Murphy said. Indeed, the Trojanettes made it to the state semifinals in 2015 and 2018 while mixing in a 2015 district championship and 2017 conference title along the way. This year’s state playoff run was also unforgettable, as the Trojanettes knocked off a pair of college-bound pitchers — York College and La Salle — before running into Kresley and Becahi. 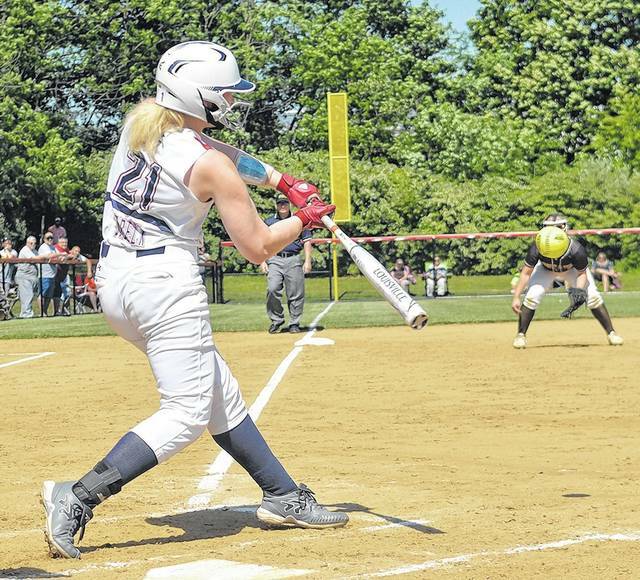 Miranda Bohn is the prototypical ace for the Nanticoke Area softball team. She proved it last week in the PIAA playoffs. Bohn, a senior, pitched two complete games — including when she went the distance in a thrilling 14-inning win over East Pennsboro on Thursday — and struck out 16 batters to help the Trojanettes advance to the semifinal round. For her efforts, Bohn was named The Citizens’ Voice Athlete of the Week, presented by Surgical Specialists of Wyoming Valley. Q: How did your arm feel after throwing 14 innings? A: (Laughs) It’s been sore, but I’ve been resting it this past weekend, so it’s gotten better. Q: The longer a game like that goes, do you have to change the way you pitch to stay sharp? Q: What worked so well for you that game and in the postseason so far? A: I think my drop curve has been working pretty well. And, just spotting my fastball better in the locations I need to. Q: Did the team get the sense as the season went on that a deep state run was a real possibility? A: Yeah, that was always in the back of our head. We’re never looking too far forward like, “Oh yeah, we’re going to win districts and we’re going to win states.” We kind of just take it game by game. But as the season went on, we got more confidence in ourselves that we can actually do this. Q: You’re playing Bethlehem Catholic in the semifinals. What’s the plan for the game? A: I don’t really know too much about them. We know they have good sticks, so they’re going to hit a lot and they are probably going to bunt. So, we’re just going to have to hope our defense does as good as it’s been in the past. Away from softball, Miranda likes to ... hang out with her friends. If Miranda could meet anyone in history, she would like to meet ... Babe Ruth. If Miranda could travel anywhere in the world, she would go to ... Italy. Miranda’s favorite thing about softball is ... the bonds she has made with her teammates. For Miranda, the most difficult part of softball is ... putting in the extra practice during the season. One thing Miranda couldn’t live without is ... her cell phone. Miranda’s biggest role models have been ... her grandparents. One word that best describes Miranda is ... athletic. Miranda’s biggest fears are ... spiders and snakes. If Miranda could have one superpower, she would want ... the ability to read minds. If a movie were made about Miranda’s life, she would want to be played by ... her teammate, Katie King. One talent Miranda doesn’t have, but wishes she did, is ... gymnastics ability. Up next, Miranda ... will attend and play softball at Misericordia University. She is planning on studying medical imaging. NEWPORT TWP. — Flash back to June 9, 2015. The Nanticoke Area Trojanettes had just lost to Bethlehem Catholic in the PIAA Class 3A softball semifinals, falling one win short of the state championship game. “When we walked off the field, there was a level of, ‘Are we ever going to get back to this point?’” admitted Ryan Stetz, the head coach. No matter the talent, there was plenty reason to be skeptical, starting with the fact that only four teams in a class with 162 schools make the state semifinals. In 2016, it was an injury and a superior District 2 team, Abington Heights, that derailed Nanticoke Area. Last year, the Trojanettes had an undefeated regular season and the best hitter in the league, but failed to make it out of the district tournament. Seniors Miranda Bohn and Megan Murphy have been with Stetz the whole time, hoping there’s a redemption theme in today’s 12 p.m. Class 4A semifinal against Bethlehem Catholic at Pine Grove High School. While Becahi has played the standard 21 innings over its last three games, Nanticoke Area comes in having gone to extras in three straight games that amounted to a whopping 33 innings. Murphy and Bohn first played softball together in junior high, when, at the time, they had a few other Class of 2018 teammates. Today, they’re the only seniors on Nanticoke Area. Murphy and Bohn immediately showed their potential at the high school level, earning starting jobs with the varsity as freshmen. Stetz said it was Murphy’s “athleticism and versatility” that caught his eye. He added that Bohn was a can’t-miss talent, even back then. “When she first started, I had her in right field … because I just knew she had to get on the field someway,” Stetz said. Bohn has since developed into one of the best pitchers in the Wyoming Valley Conference. Bohn is 12-6 in league play with a 0.88 ERA and 0.85 WHIP, while she’s also the Trojanettes’ leader in batting (.385). Bohn and Murphy are tied for the team lead with three home runs each. Murphy is batting .306. Murphy, a third baseman, is 3 for 9 with two runs and three RBIs in the two state playoff games, each of which featured Nanticoke Area coming from behind to win. Once fall rolls around, Bohn and Murphy will be enrolled at Misericordia, where they will extend their careers as teammates with the Cougars’ softball team. And, then, the onus will be on multi-year starters second baseman Brinley Sobeck, shortstop Gabby Rakowski, first baseman Jilann Baron & Co. But, rest assured, the Trojanettes are in no hurry to see this season come to an end. Once the celebration died down following Nanticoke Area softball’s improbable state quarterfinals victory Thursday evening, coach Ryan Stetz tried to explain how his team kept its season alive. The Trojanettes defeated East Pennsboro in 14 innings, 3-2, despite finding themselves on the wrong side of a no-hitter for nine frames, striking out 18 times and ultimately collecting only two hits. They were constantly on thin ice while in the field, too, as the Panthers stranded 19 base runners. Despite all that, of course, Nanticoke Area is one of two Wyoming Valley Conference teams slated to play in Monday’s PIAA semifinals. Stetz might be selling himself a bit short, though. A few crucial decisions kept Nanticoke Area in the game until the end, when Gabby Rakowski’s grounder to the right gave Jessica Skladzien just enough time to race home for the win. • Top 6, scoreless game, one out: The Panthers led off with their Nos. 2 and 3 batters, who quickly moved into in scoring position. McKayla Danner then popped out to right field, giving Kara Birosak plenty of time to tag up and score from third — except, Stetz made sure catcher Katie King appealed the run before Birosak even had time to celebrate. On appeal, Birosak was ruled to have left third base early; the ensuing double play kept EP off the board. • Top 8, scoreless game, one out: EP again had two runners in scoring position when Stetz elected to intentionally walk clean-up hitter Jackie McCrea and load the bases. An infield fly and grounder to third ended the inning. • Top 10, EP leads 1-0, two outs: Just like the 8th, Nanticoke Area intentionally loaded the bases to pass on Danner at the plate. Miranda Bohn fired one of her 11 strikeouts to get out of the jam. Jessica Skladzien sat at home plate and tried to process what just happened for maybe a second before she was swarmed by teammates. 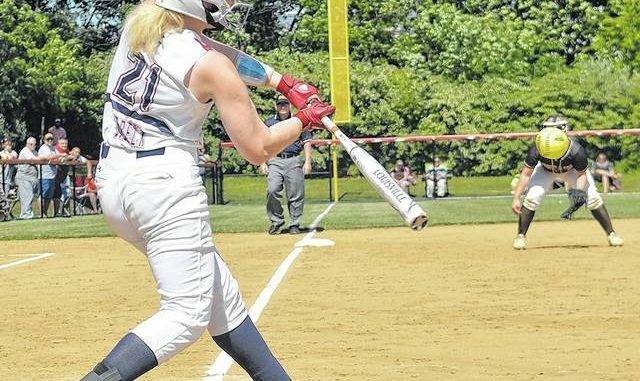 Skladzien, a sophomore who had come off the bench for Nanticoke Area softball Thursday evening, suddenly became the most important player on the field during a marathon of a state quarterfinal. She started the 14th inning on second base per international rules, promptly stole third, then focused on teammate Gabby Rakowski at the plate. As soon as Rakowski made solid contact, Skladzien took off. She slid in before the throw and tag at the plate and looked up to see the Trojanettes spilling onto the field at Blue Mountain High School. With Skladzien’s winning run on Rakowski’s one-out fielder’s choice, the Trojanettes defied math and overcame an overwhelming performance from East Pennsboro pitcher Cailey Joyce. 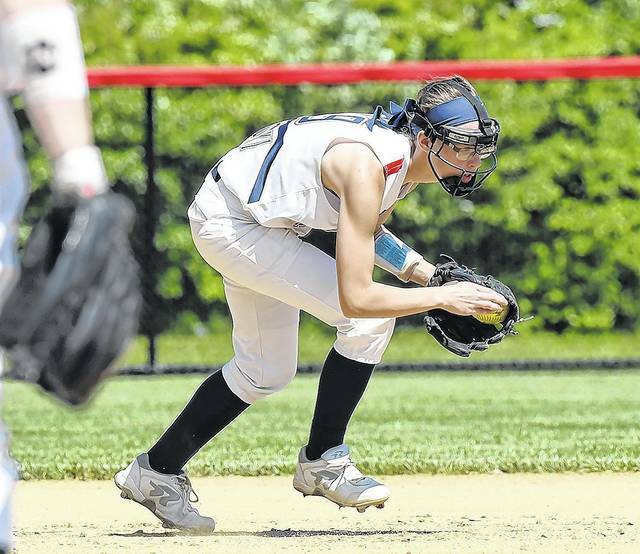 Nanticoke Area struck out 18 times and collected just two hits, but it came up with clutch plays when it needed them the most to defeat the Panthers, 3-2, in a PIAA Class 4A quarterfinal that went 14 innings. “I was in shock,” Skladzien said. “I was laying there, and I was like, ‘Oh my god, I just scored the winning run. That’s crazy.’ It was just great to see everybody come out. “The two seniors, I know they were crying. We don’t want their season to end because it’s just so important to them.” The Trojanettes will face Bethlehem Catholic in the state semifinals on Monday following the latter’s win over Tunkhannock. As Nanticoke Area’s Jess Skladzien slid across home plate, she looked wide-eyed at the umpire for the call. Even if her eyes were closed, she would have known the outcome by the celebration erupting from her dugout. Skladzien scored the winning run with one out in the bottom of the 14th inning as the Trojanettes completed arguably one of the most improbable wins in the program’s history Thursday, defeating North Pennsboro 3-2 in a PIAA Class 4A softball quarterfinal game at Blue Mountain High School. District 2 runner-up Nanticoke Area (17-7) won despite striking out 18 times and getting one hit off North Pennsboro pitcher Cailey Joyce, who will pitch for La Salle University next season. The Trojanettes will play District 11 champion Bethlehem Catholic, a 4-1 winner over D2 champ Tunkhannock, in the semifinals on Monday at a site and time to be announced. When the two played in the semifinals in 2015, it was at Blue Mountain. D3 runner-up North Pennsboro ended its year at 22-2. After the international tiebreaker — where each team starts the inning with a runner on second — began in the 10th inning, Nanticoke Area answered runs by East Pennsboro in the 10th and 11th. The 11th also produced Nanticoke Area’s only hit, an RBI single to right-center field by Gabby Rakowski to scored Katie King. Rakowski would also have her hand in the game-winning run in the 14th. Skladzien started the 14th on second base and moved to third on a wild pitch, just getting under the tag. An out later, Rakowski hit a grounder to second baseman Kara Birosak, whose throw home was too late to get Skladzien. Contact was hard to come by against Joyce, who had just four balls hit to the outfield all game. Three were flyouts off the bat of Bohn. The run capped a 14th inning where Nanticoke Area survived a bases-loaded, no-out jam in the top of the frame. Grounders to first baseman Jilann Baron and third baseman Megan Murphy led to forceouts at home. Bohn then got a flyout to end the scare. East Pennsboro also had a run negated in the the sixth inning on a flyout when the runner left third too early. The Panthers threatened often but left the bases loaded three times and stranded 20 runners. “Don’t remind me,” Nanticoke Area coach Ryan Stetz said. “I don’t know, just something special today. I can’t answer it. I’d like to think it was coaching, I’d like to think it was talent, but sometimes it just works out your way. We beat a great team — 22-1 with a pitcher going to La Salle. First, the Nanticoke Area community rallied behind its softball team. Then, the Trojanettes rewarded their faithful fans with a thrilling win.Two hours south at Methacton High School on Monday, lefty Miranda Bohn turned in another phenomenal performance in Nanticoke Area’s 4-3 PIAA Class 4A playoff win against Upper Perkiomen. Madison Stashak re-entered the game in the top of the ninth and hit a game-winning single that scored Megan Murphy. In eliminating the District 1 champion Indians (17-5), the District 2 runner-up Trojanettes (11-6) advance to play Thursday in the state quarterfinals against East Pennsboro at a time and place to be announced. “She is just moving the ball in and out — you can’t time her right now,” Stetz said. Brinley Sobeck scored during the next at-bat, a fielder’s choice by Murphy, which put Nanticoke Area ahead 3-2. Given the one-run lead on Stashak’s line drive single up the middle that scored Murphy, Bohn closed the door with a 1-2-3 ninth to seal the victory. Bohn, Sobeck, Baron, Katie King, Stashak and Jen Kurkoski had one hit apiece. This time, extra innings went Nanticoke Area’s way. Madison Stashak singled in the game-winning run in the top of the ninth as the Trojanettes outlasted District 1 champion Upper Perkiomen 4-3 Monday in a PIAA Class 4A state softball first-round game at Methacton High School. District 2 second seed Nanticoke Area moved to Thursday’s quarterfinals. The Trojanettes will play District 3 second seed East Pennsboro at a site and time to be announced. East Pennsboro defeated D12 champion Bonner-Prendergast 4-0 behind a no-hitter by Cailey Joyce. Nanticoke Area fell in the D2-4A championship game to Tunkhannock 1-0 in 10 innings on Friday. The Trojanettes led 3-2 going into the bottom of the fifth when Upper Perkiomen scored a run to eventually force extra innings. After three scoreless innings, Megan Murphy hit a two-out double in the top of the ninth. Stashik re-entered the game after being subbed out for defensive purposes and singled Murphy home. Murphy had a solo homer in the second inning for Nanticoke Area’s other extra-base hit. Kelsey Bernhart homered for Upper Perkiomen, which finished with six hits off Nanticoke Area starter Miranda Bohn. This year’s District 2 softball championships hadn’t been a breeding ground for pitchers duels or close games. Final scores: 10-6, 13-2, 8-0, 5-3, 9-6. Then came Friday’s finale, which checked all the boxes of a classic title game. After Miranda Bohn, Kendra Schultz, Hope Jones and Erin Dunn came up huge in the first nine innings, Tunkhannock’s Faith Jones and Gina Walsh provided the walk-off play in a 2-1 win against Nanticoke Area for the Tigers’ second straight district title in Class 4A. Tied 1-1 in the bottom of the 10th with two outs and the bases loaded, Faith Jones, the leadoff hitter, ripped the ball to center field. The ball fell and Walsh scored the winning run. Tunkhannock (13-3) will open the PIAA tournament 4 p.m. Monday, when it returns to Wilkes’ Ralston Athletic Complex and plays District 3’s No. 3 seed Bishop McDevitt. Nanticoke Area (10-6) also makes the state playoffs, but will hit the road to play District 1 champion Upper Perkiomen 5:30 p.m. Monday at Methacton High School in Montgomery County. Having seen his ace left-hander pitch dozens of games over the years, Stetz called Bohn’s performance Friday her best yet. Bohn pitched nine scoreless innings against Tunkhannock — which finished runner-up in the state last year — with 11 strikeouts. When things broke down in the 10th, it wasn’t exactly Bohn’s fault because the Trojanettes committed three errors, and international tie-breaker rules went into effect that placed a leadoff runner at second base. Long before it ended, though, Nanticoke Area was the victim of some spectacular defense by Tunkhannock. The Trojanettes had two runners on in the third, when Dunn, the right fielder, made a sliding catch for the last out that saved at least one run from scoring. Two innings later, catcher Hailey Farr recorded the last out by throwing out a runner trying to steal second. Earlier, the fourth inning ended on a double play. Nanticoke Area took its 1-0 lead when it manufactured some small ball into Megan Murphy’s steal of home in the 10th. But Dunn prevented more runs from scoring when she made a spectacular grab in foul territory for the third out. Trailing 1-0, Tunkhannock had runners at the corners when courtesy runner Nicole Howell scored on a Jena Simmons groundout. A hit-by-pitch, strikeout and then back-to-back errors brought the game to its conclusion with Walsh scoring. Tunkhannock starter Hope Jones pitched three scoreless innings and Schultz threw the rest. Together, they allowed only three hits with 12 strikeouts. Gabby Rakowski, Brinley Sobeck and Bohn each singled for Nanticoke Area, which did not record a hit in the final five innings. Some fans would argue that hitting is contagious, a statement often made in baseball and softball. Maybe there’s truth to that theory, maybe not. For at least one day, Friday, Nanticoke Area softball showed where it stands on the debate. Jen Kurkoski, Gabby Rakowski, Miranda Bohn and Jilann Baron were just a few of the Trojanettes who keyed a come-from-behind 11-6 win against Berwick in the District 2 Class 4A quarterfinals, in which Nanticoke Area scored 11 runs on 10 hits in the third and fourth innings. Trailing 2-0 after Berwick’s Bloomsburg-bound senior shortstop Sammi Starr scored a pair of runs, Nanticoke Area started the third with bunt singles by Kurkoski and Rakowski. A single by Bohn scored Kurkoski and cut the Trojanettes’ deficit in half, while a Brinley Sobeck sacrifice fly scored Rakowski and evened the game at 2-2. Next came Baron’s RBI single and then a Madison Stashak grounder that scored a run, making it 4-2 after three innings. Nanticoke Area (9-5) picked up in the fourth where it had left off, already scoring a run and loading the bases before Berwick recorded an out. That’s when Baron, the clean-up hitter, connected for her first home run this year in league play or playoffs. “As soon as I make contact, I could just feel it — if it’s going to be good or bad,” Baron said. Baron left no doubt with her fourth-inning blast, which cleared the bases as well as the left-field fence to give the Trojanettes a 9-2 lead. “It comes off her bat really hard,” Rakowski said of Baron. The Trojanettes tacked on two more runs to equal their season-high of 11 runs. In total, Nanticoke Area tallied 20 plate appearances, 11 runs, 10 hits, one walk and reached by error three times in the third and fourth innings. From the top of the order, Rakowski was 3 for 5 with two runs; Bohn 2 for 4 with two RBIs; Sobeck 1 for 3 with a walk, RBI and run; Baron 2 for 4 with five RBIs; Katie King 1 for 4; Liz Redenski 1 for 4 with a run; Stashak 1 for 4 with an RBI; Jess Skladzien 0 for 3 but reached on error; Kurkoski 2 for 2 with two walks and two runs. Berwick rallied with two outs in the seventh on Brooke Stout’s three-run home run, but the damage had already been done. Berwick’s Lydia Hess was 2 for 2 with a walk. Starr was 2 for 4 and, when the Bulldogs trailed 4-2 in the fourth, she hit a fly ball to the warning track that was nearly a two-run homer. While No. 6 Berwick’s season comes to a close at 8-7, No. 3 Nanticoke Area will play at No. 2 Valley View 4:30 p.m. Tuesday for a spot in the district final and state tournament. Head coach Ryan Stetz calls Miranda Bohn “the rock” of Nanticoke Area’s softball team. Bohn is the Trojanettes’ best hitter, most experienced player, a leader, and their only pitcher. Well, the only pitcher they use, that is. Some of the WVC’s top teams use a one-two punch in the circle: Alexa McHugh and Nina Cencetti of Pittston Area, Hope Jones and Kendra Schultz of Tunkhannock, Gwen Glatz and Cassidy Graham of Wyoming Area. It doesn’t happen often, but even Holy Redeemer’s Morgan Bienkowski and Hazleton Area’s Erika Book have been relieved of their duties on a rare occasion. This season, 50 individuals have pitched for the 18 teams in the conference, which comes to about 2.7 pitchers per team. Bohn, however, through Wednesday, was the league’s only player who’s pitched every inning — 74 of them — for her team in league play. “We’re going with her and she’s actually pitching better this year than last year, when we went undefeated in the league,” Stetz said. With touch, power, location and the ability to throw any pitch in any count, the left-handed Bohn was 6-5 with a 1.32 ERA and 78 strikeouts. She will play next season at Misericordia. As the season wraps up, Nanticoke Area’s offense is starting to come around, too. After graduating a big and talented class from last year, seniors Bohn and Megan Murphy, junior Brinley Sobeck and sophomore Gabby Rakowski are some of the hitters Nanticoke Area will rely on in districts. 2017 results: 14-1. Lost to No. 4 Wyoming Area, 6-5 in 10 innings, in the District 2 Class 4A semifinals. Players to watch: Seniors — Miranda Bohn, P; Megan Murphy, OF. Junior - Brinley Sobeck, 2b. Sophomores — Gabby Rakowski, SS; Jessica Skladzien, 3b. Freshmen — Olivia Nice, OF. Key Players Returning: Miranda Bohn, P, Sr.; Megan Murphy, OF, Sr.; Brittany Sobeck, INF, Jr.; Gabby Rakowski, INF, So. Outlook: Nanticoke suffered some big losses to graduation including two-time Times Leader Player of the Year Lipowski, who was the WVC’s premier power hitter. So the offense might not have the same firepower, at least early on. However, Bohn is an all-state lefty who will keep the Trojanettes in every game and keep them a contender.